PBS Host comes to tout MATC Promise program on his One Great Idea tour. 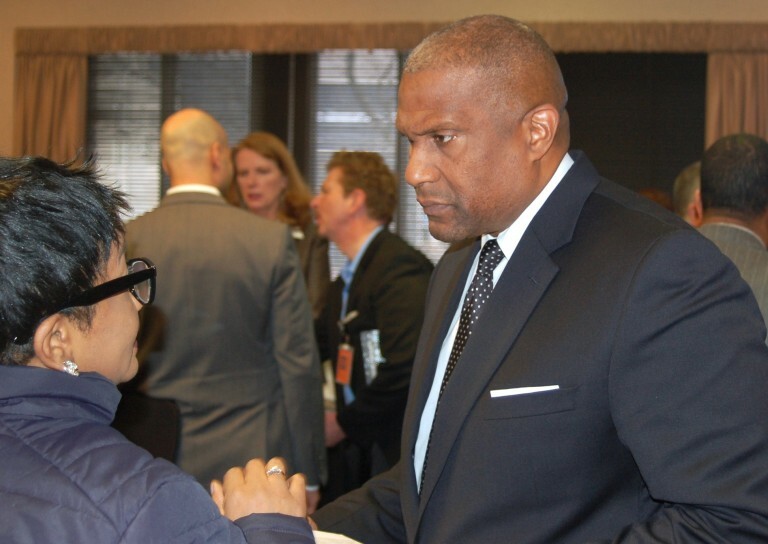 PBS Host Tavis Smiley greets MATC community leaders at a reception at the downtown campus after taping his program. Photo by Andrea Waxman. The audience in Milwaukee Area Technical College’s (MATC) Cooley Auditorium fidgeted excitedly as the MPTV crew adjusted equipment and tested sound and light levels. Filled to capacity with fans of PBS host Tavis Smiley for the taping of his talk show on Tuesday, the crowd grew quiet as Smiley introduced Vicki Martin, MATC president, and two MATC alumni. Milwaukee was the second city Smiley visited during his five-day, five-city “One Great Idea Tour.” Starting Monday in Cleveland, where he discussed the city’s universal pre-kindergarten program, he is highlighting innovative programs that offer solutions to some of the country’s most difficult problems. Smiley credited longtime friend Bohdan Zachary, the new MPTV general manager, with sparking the series. “I think we’re leading the nation when we talk about two-year colleges that are free,” Zachary replied. 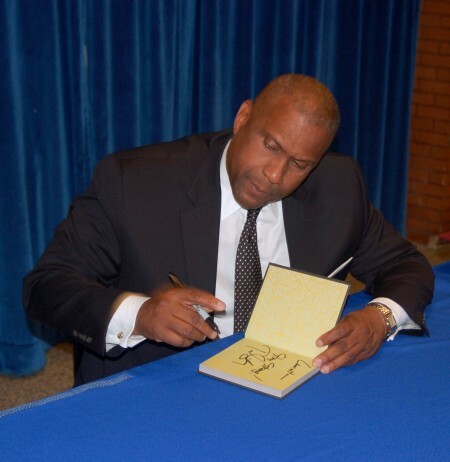 Tavis Smiley signs copies of his new book, “50 for Your Future” at MATC. Photo by Andrea Waxman. Called MATC Promise, the free tuition program has accepted the first 1,500 participants, who will start college in the fall, according to MATC President Vicki Martin. Students must apply for all available federal and state financial aid but MATC will cover any remaining costs for tuition and fees with funds raised from private donors. The college also will provide many support services to ensure participants’ success in meeting program requirements, which include attending full time for four consecutive semesters, maintaining a 2.0 grade point average and serving eight hours of community service per semester. Currently, the program is offered to graduating high school seniors with a 2.0 grade point average and a 90 percent attendance record in their senior year. “The data shows if you go direct from high school and you’re full time, your chance of completing (your degree) in two years dramatically increases,” Martin said. Martin told Smiley that MATC started to think about making a two-year degree affordable about a year ago. “I went to a national conference and heard about how Tennessee is doing it,” she said, adding that she thought the Milwaukee community would step up with a public/private partnership to fund the program. The first Promise program started in Kalamazoo, Michigan in 2005 and free college tuition programs are now offered in more than 18 states, according to the Campaign for Free College Tuition, a nonprofit advocacy organization. “We know that in our community 50 percent of the young folks are economically disadvantaged. … So we need to offer them this free program,” Martin said. The college has raised 80 percent of its $1 million goal for MATC Promise from individuals, companies and foundations, she added. MATC’s goal was 1,000 students the first year and 3,000 applied, but half were unable to complete the required Free Application for Federal Student Aid (FAFSA) documents, Martin said. MATC could have accommodated all 3,000 applicants. The requirements for next year will be simplified, Martin said. “When we reach out to (high school) juniors, we’re also going to reach out to their parents so they’re part of the process and they understand exactly what’s required,” she said. MATC freshman Aniah Chinn, 18, who came to see the Tavis Smiley show, heard about the Promise program from a friend. “I think it’s a good idea,” said Chinn, who would like to teach creative writing at the college level. She is taking two classes and working part time. “Tuition should be free. We shouldn’t have to pay for an education. We already have to pay for so much other stuff,” said Chinn, who is paid $8.50 an hour as a banquet server and gets some help with school costs from her mother. Second-year MATC student Patina Lawson, who will graduate in May with a degree in television and video production, returned to school after working in information technology for more than 18 years. She was laid off, she said. “I think (the Promise program) would be good but what happens after two years?” I know there are people here who are working on a two-year degree, but it takes longer,” Lawson said. MATC Promise participants will earn associate degrees. Martin noted that the program will not only help students find good jobs, it will also benefit employers seeking skilled workers. It was cool to tune in to watch Tavis and see that he was taping at MATC! It’s great to have Milwaukee featured for something positive, esp. regarding education. MATC has many great programs and is as important as UWM–esp. for those of lesser means. The more MKE’s populace gets higher ed the better off the whole region will be. Kudos to all the Promise donors who realize that!